Megapolis 2022 - Environmental problems are solved in cities: on Saturday 13.10.2007 over a thousand of people are expected to meet and discuss global environmental issues in Vanha Ylioppilastalo in the heart of Helsinki. 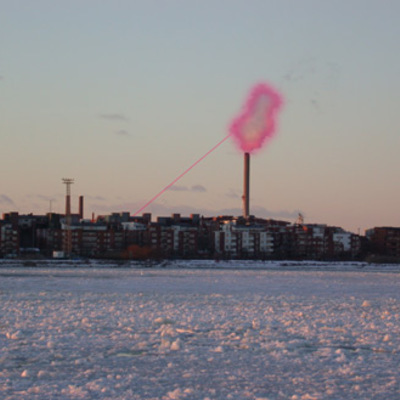 Pixelache invites you to share a morning coffee in the company of the Parisian artist duo HeHe, who will present their upcoming project ‘Nuage Vert’ (‘Green Cloud’) that is to be seen in the skies of Ruoholahti during February 2008. This presentation is a part of Megapolis 2022, a one-day event initiated by the environmental organisation Dodo.